Alf Skrastins has provided a list of trails that are suitable for xc touring skis. Scroll down to see the trip reports. To leave a report, click on add one. Had to check out this stunning location before the snow melts! Hey Chuck: How do you ski down the Stanley Glacier trail on non metal edged skis on crusty snow? You must be breaking speed records. But how do you stop? Looks like you had AT gear for the Ramparts. Skiing down the Stanley Glacier trail was easy, because my Light Touring skis DO have metal edges, and the snow was not crusty (it had warmed up). For the Ramparts trip I did use AT gear (as noted in my album caption), because it’s a long narrow trail down through the thick trees and I am used to it being icy, however the new snow made it also easy. Great that you found the fresh snow last week. We took a day off work on April 16th (the bluebird day) and found great powder up on the Smith Dorrien. Now its time to try crust skiing. Yesterday’s weather would have made it more spectacular here, but I can’t be everywhere on blue bird days! Actually, last night’s snowfall of 5 to 25 cms (depending on elevation), made ski conditions excellent. I have never had such fun on the descent. Time to get off the Groomed tracks with conditions like this. I was thinking about hitting Egypt Lake Cabin on Saturday afternoon. Could you tell me if the lower Sunshine Ski out to the Healy Creek trail is still ski-able and what you think the avalanche conditions may be like up on Healy Pass with all that new sweet stuff you skied? Oh ya, did you “ski up” the powder on Healy pass and leave no more room for fresh glorious signature turns? It was totally skiable yesterday. I never took my skis off all day (except to take off my skins at the top)! It is very warm today, so that first half km to the first bridge maybe a little thin by Saturday. You will have to make your own judgement on the avalanche risk. The only significant exposure is the south facing avi paths on the way up to heally pass. Most other avalanche terrain can be avoided. That being said, possible for more wide reaching avalanche risk where you might not expect it if the forecast heat, rain and snow load materializes. Northern sections of Hwy 93 are closed in expectation of elevated risk to road. Early start as they say but only a useful tack if there is a solid freeze. That would make skiing down the other side to Egypt another potential hazard. Another head smash ski wouldn’t be good. I had a nasty unexpected spill several weeks ago on a frozen ski out and am still recovering so my season is done as the risk is too high if the timing isn’t perfect. Little Crowfoot Peak, April 16. After looking at the weather and avy forecasts, I realized that Tuesday was a day not to be missed. A very solid overnight freeze made for fast travel below treeline, although the constant edging required on the icy side-sloped trail in and above the canyon got a bit tedious after a while. Coverage is generally very good in the canyon, but there is one snow bridge that is sagging close to the water, and looking a bit thin. Above treeline, soft dry snow conditions in the north and easterly facing moraines and glacier below Crowfoot Peak gave more relaxing uphill travel, and superb downhill turns. Clouds rolled in later, keeping the below treeline crusts firm but edge-able for the exit. Stunning coverage of your trip Steve and such wonderful turns. If I were 10 years younger, I wish I had pursued Alpine Touring. But I thoroughly enjoy living vicariously through many trips on Backcountry by Chuck, yourself, Alf’s coverage of Amiskwi, and many others. I am in awe!!! A blustery Saturday on the Birdwood Circuit. I joined up with an ACC group for the loop, which connects the Burstall and Commonwealth valleys via Birdwood and Smuts passes. Starting out from the trailhead not long after 8 this morning, we had quick travel conditions through 5-7 cm of recent dry snow on firmly frozen trail and crusts, up to the slopes that take one out of the Burstall valley and onwards to the first pass of the day below Mount Birdwood. For xc skiers- skiing up the logging road and across the flats to the Burstall headwall, or to the last trees below the Robertson, would have made for a very enjoyable trip for someone on light touring skis this morning. For us though- above Burstall trail and leaving the trees behind as views opened up to the south and west, we found one 10m pitch though rocky terrain that required a brief bootpack. Back on skis, the weather closed in and the winds picked up as we reached the summit of Birdwood Pass. Once over the top we found calmer air, and generally very good and consistent powder skiing on the descent into Birdwood Creek, where it was skins on again after for the next climb- to Smuts Pass. Winds were howling out of the west again at Smuts, but good turns were had on sheltered east aspect terrain all the way to valley bottom-once we had tiptoed with skis on across windblown tundra in couple of short spots at the most easterly of the two Smuts passes. Commonwealth valley out to the highway was uneventful- supportive conditions with easy descending and enjoyable kick and glide in the soft new snow, which was getting a bit damp at valley elevations by 2 in the afternoon. Below- the view north from Birdwood Pass, towards Smuts Pass. With the deteriorating weather- my camera stayed safely stowed away for the remainder of the tour. This is enough to entice us back from the coast! Pouring rain here. Those are great pics of the ascent and descent, and interesting storyline… Thank you Steve. I spent an enjoyable first week of April at Amiskwi Lodge, near the north corner of Yoho National Park. It was still winter up there, with a 2 metre snowpack and 22cm of fresh snow in the second half of the week. The lodge is located at the tree-line transition between forest and alpine meadows, so it offers wonderful opportunities for touring and spectacular scenery. Thanks Alf for sharing those great photos. Two words: Alpine Paradise! After a week of riding dry dirt trails in NW Calgary, in warm sun on crocus covered hillsides, I still wasn’t quite ready to hang up the skis just yet. On Sunday I went with my brother Andrew to Burstall, visiting both the south and north passes. The blustery day started off with a promising mix of sun and cloud, but deteriorated to heavy overcast and light snow in the afternoon. Travel conditions were very good, on hard-packed trail to treeline, and smooth solid crust in the alpine. New snow amounts from 2-7 cm softened things up a bit, but the wind had created a mix of crusts and shallow soft slab in the alpine, giving less than ideal downhill skiing quality. Poor visibility didn’t help either! Sheltered treeline glades skied “OK”. Some previous skiers had elected to slide back down the headwall trail, but the well filled in gully exit seemed like a better choice to us. Crossing the firm snow of the flats on the way out was actually quite enjoyable- with the wind at our backs and VR45 giving great kick and glide- making it feel like xc skiing, but on AT gear. Despite a bit of disappointment in the weather and the quality of the powder turns- it was still a fine excursion. South Burstall Pass. -4C and crystal clear in the parking lot at 9:30 am. At lower elevations there is an inch of powder overlying crusts. The new snow has turned to refrozen slush in sunny spots. In the alpine there were good turns to be had on lee north-facing slopes. Anything south- or west facing was crusty. The radiation was intense at times. Trailbreaking was very easy, with the crusts providing ample support. Some cumulus clouds built up in the afternoon and it was +4C when I got back to the parking lot at 5 pm. p.s. skin wax (glop stopper) is indispensable in these conditions. I waxed the tops of my skis to keep them from icing up. I used some blue-extra for the return trip, which worked well in shady spots but not in sunny and iced-up places. -3 to start at the fish creek lot at 7. +4 on return at 1. No fresh snow down low but an inch or two up high. Just enough of a freeze to make uphill travel in wolverine valley supportive. Just below ankle trail breaking off the main trail above treeline. Skiing down was dust on a mostly supportive crust at 1030 in the sun. Clouded up for second run (so no cream, butter or corn) and got a bit more grabby. The run out the valley was all supportive crust without the solar input and a bit challenging on the final steep down through the trees back to the resort. Ski out was still icy hard on descent until a few 100 m away from the car. A handful of avoidable thin spots below temple lodge and one gravelly patch right at the end. Some cautious bumps near the bridge just below the lodge where the ski out parallels the road. Easy to launch oneself onto the gravel road given the steep bumpy curve if not checking speed. Nobody else in the valley today. Okay, I had not planned to do this… but it was enticing! If you plan to do it, try it counter clockwise. You sure cover some ground with your light skis! Did you ski out Wolverine Valley or Purple Peak? Wolverine Valley… I might have preferred Purple Peak! Chuck, I’ve been following your exploits all winter. You’ve got the heart, lungs, legs, and spirit of a 25 year old. Keep on trucking, and I look forward to more high alpine antics in the coming month. Thank you for those kind words Henry. We have missed your playful image manipulation this year, and are still hoping that you will venture back west some time. With 8 cms of fresh snow on top of an old track, and sunny skies, this day had lots to promise… but it got even better! Easy skiing conditions on the lake, and a true backcountry experience with no red chairs. Chuck: Great photos of Mt. Balfour and the mountain goats! Wow! Hector Lake is a big lake, it must have taken some time to ski across! We were a bit more North from you on the Wapta and Mt. Gordon. Powder snow on the icefield and a bluebird day, amazing! Yes Ulrike, it was about 5 km across the lake, but travel time was actually pretty fast as there was little to no ski penetration. And somehow it was not too hot in the sun. A highlight of our winter! How about some pictures of your trip… don’t you carry a camera? Would have been magnificent up on that icefield. Thanks for the visual reminder of the upper alpine. The world seems all below you when on top of Mt. Gordon! I was curious to see how our local backcountry was faring. Two of us skied the “Pigs Back” circuit in Commonwealth Creek today, and the lower than normal snowpack was easily observed via the height of the snowbanks along the Smith-Dorrien road. This was confirmed by a below treeline probing of 100 cm at best (much less in the forest) and a treeline depth in larch glades of only 160 cm. Under the new storm snow of 7-15 cm, a crust of varying thickness and strength was present on all of the aspects that we skied ( E, W and N) up to at least 2400m, bridging a weak and uncohesive snowpack. Although the crust was generally supportive thanks to some decent overnight freezing, there were some short sections of disconcerting wallowing. Alpine depths varied widely, with many more rocks evident than in prior years. All of that doesn’t sound too great, but it was a fine tour nonetheless, with a reasonable number of good turns made (but cautiously due to the variable underlying surface). The day stayed mostly cloudy so solar input was limited, with no avalanche activity observed despite the omnipresent crust giving a good sliding plane under the new snow. At 2 pm back in the Commonwealth valley bottom, the new snow was moist, but still gave reasonable kick and glide with a skiff of VR45 underfoot on the AT skis, for the easy trail back out to the highway. A highlight of the day was watching 5 goats hanging around under the cliffs of Commonwealth Peak. No pix as the light was poor. The Campbell week looked awesome. What a spot. And good timing of course. With the tropical weather we had since I went there 2 weeks ago, I had no (good) expectations about the snow conditions. To echo what Chuck mentioned in his last visit, this is now a true backcountry destination, with metal edge territory to ski down and skins or else to get up. Starting with VR65, in an attempt to avoid klister, I quickly switched over after 500 meters from the parking lot. Trail was hard crust all the way to the Shadow Lake lodge, with the ski tracked side slowly fading away under the melt of the recent days. Slower than usual conditions, my initial plan to tour at Gibbon Pass was shelved. Crossed a small stream of snow melt water at about km 7.5, quickly eroding the snowpack on the trail. At km 9, I ran out of klister and changed over to short skins which brought relief to my arms from slipping back. A few ice flows on the first 1.5 km after the turnoff for the lodge. After lunch by the lodge, I had no intention to ski to the lake, as the views from Mount Ball were pretty gloomy under the foggy and cloudy skies. But I figured it might be better to wait a bit longer to allow for softening of the trail on the way back. So, I skied to the bridge. The creek coming out of the lake is now losing its ice cover quite rapidly. No point to enjoy a lack of views of Mount Ball from the red chairs this time. Stepping off the ski track from the lodge to the lake entailed sinking through isothermal corn snow underneath a 15 cm melt-freeze layer. The return was fairly slow, with a preference for harder surface left by the ski traffic in previous weeks, as opposed to the softer ski track. Sure glad I had the edges on my skis to control on the steeper sections. Am I the only person who gets a 404 Error when I click on the Link? Sorry Chuck. This should work. OMG… my trip was only 4 days ago! Thanks for the update Normand, but this is so sad to see. At least we hit it right on our earlier trips, and so did a few others. Indeed. It was like mid-April conditions I experienced there two years ago. Can’t wait to get back up there with a grip wax-only ski base. Chickadee Valley. Following recent reports and better than forecast weather we ventured up on light touring skis with skins. Typical spring sun affected snow and some careful snow bridge crossings that will soon be gone. Fun was had by all! Boom Lake – is there any snow left out there? Bullet proof hard trail due to lots of snowshoe traffic. Skied with light touring metal edged skis and skins. Followed Chuck’s ski track across the lake in hot sun, not a breath of wind, great view of frozen waterfalls. Fast ski out on hard snow, with a few soft spots. Walked the last hill with the corner which was in the shade and icy. Hopefully the weather cools off and we get some snow, otherwise could be a short season! This trip was a highlight of the winter, so it deserved a revisit on a blue sky day. I am classifying it as a backcountry trip because the avalanche risk is elevated now, and I used light touring metal edge skis which allowed me to use skins on the way up and more control on the descent. Remember to bring your refreshments! Just amazing Chuck! You keep me inspired not to give up on winter yet! Nice photos Chuck. That’s my type of snack in the outdoors! Especially with such Ball’istic views to savor an improvised feast. I usually keep the chips in the car, before the drive home. Chickadee Valley – a T-shirt and sun hat day! I’m sure conditions have changed with two days of intense solar radiation, and I nearly got heatstroke in that brilliant sunshine! Very icy at bottom to start, we really appreciated our kicker skins. On descent, one must watch for twigs, the occasional log, and try to avoid taking a cold bath. Beautiful day out there, and we had the valley all to ourselves (with a few tiny birds), but the snow is quite sun-affected. Heat… what heat? Bart looks frozen on that first snow bridge! Where is the picture of the Icefall… did it melt away? Thanks for the update Diana. We saw a few tiny avalanches up high on Mt. Whymper, nothing to write home about, but heard something louder from the Boom side as we were nearly back down. There might have been a good show later in the day. I’ll echo MaSid’s and Chuck’s comments about today being a perfect day for backcountry touring. My destination was Mosquito Creek towards Molar Meadows. Blue skies, mild temperatures, a soft blanket of snow and spectacular mountain scenery are the ingredients for a great ski tour. The overall snowpack is thin and weak. The forecast warm temperatures in the next 10 days are setting up for a rapid deterioration to isothermal snow (think Slurpee) and daily avalanche cycles. But if and when it cools down again, it could make for some fine spring skiing. -5 at the sunshine parking lot at 830. Today’s forecast dictated an alpine day. And it was spectacular. A rich and saturated day, best I’ve had in years, one of those rare perfect fleeting ones. Sastrugi cruising up the full north ridge on the windward side in a light breeze. crested a wind roll below the summit block and ran into two split boarders coming up from the east so got some assistance with the final track to the summit (boot top). Mid boot to boot top dry snow all down the north east face over a solid crust. Face stayed below zero all day. Nothing was moving but our sluffs. Moist at the base though, and all the way back through the meadows. Splitboarders did a bunch of laps. Really fun to watch experts shred the steeps. Ski out was moist but not too slushy and no lurching in and out of sunny spots. +6 back at the lot at 5. Wildlife: approaching goats eye via the ski out, a well trained pine martin came to edge of the forest, looked both ways, ran across the ski out, then stuck his head out again on the other side to see if I noticed. Too quick for the camera though. When the Weather and the Snow Conditions come together, match it up with the Spectacular Scenery at this destination, for an extraordinary day. These powder days are forecasted to continue daily, up here… It may be time to change our horizons folks! Looks fantastic! But isn’t it getting warm up there too? No… PURE POWDER at this elevation, Diana. Try it… You’ll love it! Maybe tomorrow? But I just looked at the avalanche forecast – yikes!! Yes, if you stay away from avalanche run out zones. photo 5 and 6 are not from Chickadee Valley. Looks like Crowfoot Glacier/Pass area. Its a neat “playground” there with moraines and boulders. Am I correct? NO Ulrike… I would never do that. Photo 5 is looking up at the head of Chickadee Valley (after climbing at the end of the valley through a first level of trees). Photo 6 is looking back from the Icefalls south west. Obviously you will have to do a trip up there to convince yourself! OK Chuck, I haven’t been up Chickadee Valley to the Icefall in quite a few years. Wasn’t aware that there is a glacier visible. Last year I went towards Whymper Col for some turns. Have to go back to the end of the valley. Very scenic! -13 at the sunshine lot at 9, zero on return at 3, with puddles in the parking lot. Others had been in the day before, so a nice smooth uptrack. Fresh uptrack since the new snow into heally meadows from the camp site. Departed the heally pass trail near the northernmost tarn and up onto the rampart. Mostly ankle deep trail breaking (AT gear) through open areas and up to top of ridge with the occasional deeper bits. Variety of wind slab surfaces under the fresh snow in the alpine, from Boiler plate to soft squishy slabs. No wumphing, shooting cracks or hollow sounds at all. New snow seemed to be bonding well with the mild temps and sun. Evidence of cornice collapses along the rampart that didn’t run far or trigger any lee slabs. Minor sluffing off trees and rock in steep terrain. Stymied on the traverse option by a brutal wind on top. Once I had my fill of it, returned the way I came. Cornices were building everywhere along the rampart and many other peaks, even yam and rundle were pluming on the drive home. Snow getting a bit moist in solar areas lower down in the afternoon, including the avalanche paths. With the lower snow year, trail seems to be bumpier below the bridge crossing over heally creek. Chester Lake – you can’t get a more perfect bluebird day than today! Not even all the damage from non-skiers on the ski trail out a damper on the smiles today. Quite warm in the sun, but he waxless BC skis were great. Found a GPS stuck in the snow in the meadows before the lake – well used and loved but abandoned. Garmin. Please respond to this if you left it behind. Sun mar 10: Simpson pass/twin cairns. -15 in the sunshine parking lot this morning at 830, -2 on return at 2. Intended to go up to heally and maybe traverse the rampart, but the normally smooth luge track was peppered with shallow boot prints, so took a left up Simpson. Cleaner single uptrack with an inch of fresh in it, until it diverted towards the cliffs too early. Ankle to knee deep ski pens off track in the forest in the area of Simpson pass and above through the cliff band until one got into the wind zone below NW shoulder of twin cairns, then zero! Got within about 20 m verticals of the summit without ski crampons, and with the strong wind, gave up on the traverse option and skied the north face back to wawa and down the ski out. Plume of snow raking off the monarch, but not lower peaks. Only mid boot turns on top of a supportive wind crust. Others did the traverse and got the long mellow east aspect speed cruise down to standish. Looked great. The NE shoulder descent looked like a big ugly lens of wind slab, or you were threading rocks. A good day in the alpine, without totally arctic temps, despite the wind. Felt around -20 or colder up top with the winds. Mosquito Creek to Molar Meadows. Beautiful sunny day with no wind. For those not familiar with this route, it is a relatively easy way to get into the alpine. Trail can be challenging, depending on conditions. Backcountry skis and skins are helpful. Lots of snow up there so beware of tree wells. Skied Tokumm Creek yesterday. The first few km are snowshoer-packed, and after that a ski trail continues on for a few more km to a large slide path where the track-setters got some turns. I continued on, but the trailbreaking was heavy going through the facetted and cohesionless snow. I turned uphill at the next slide path and decided to go for turns. The snow was a dog’s breakfast of windslabs, breakable crust, and loose facets, causing me to face-plant a few times. Stability was good, and I saw no avalanche activity all day. It was nice and sunny with great views all day. Just back from a quick two day camp trip (mar 4/5) crossing over the divide into BC via PLPP with cheeky and Simona. 3 feet of snow in open meadows at 6500 ft. More unsupportive at the lower end of that spectrum (especially for poles), improving with a bit of height gain. Forest travel above 6500 ft was very reasonable. Clear bluebird warm days, probably hitting -5 with strong sun settling the open meadow snow pack. Point source releases on high rocky SW aspects entraining snow and thin slabs and running quite far. Some moist snow in open areas on the way out today. Excellent Milky Way star gazing in the evening, but probably got down to -30 overnight. Good times! My wife and I skied Black Prince for the first time Sat Feb 16. -11 C at the parking lot at 11:15 am with light snow and light winds from the south. We skinned up the drainage until the last turn to the west. We didn’t cut into the forest on the left to ski the glades. Ski pen about 30 cm when we cut out of the uptrack into fresh pow. Soft yet pretty supportive. Saw a group of two skiers and another group of 2 splitboarders and 1 skier. Fun ski out of the upper drainage and spicy in the lower drainage, but very manageable. Looking forward to coming back to ski the glades! Good travel on green swix. I made it 2/3 of the way up the step after crossing the gravel bar before I put on the skins. Very thin snow pack at the pass. Good turns in the trees just below the pass. Some very large cornices hanging off ridges to the north near the pass, keep your eyes open on the way up. With thirty to forty cm’s of new snow, a base that’s finally offering decent support, mostly, and the bonus of warmer air at minus 5- superb powder skiing at Black Prince! As expected- it was busy due to quick access to safe terrain, but we easily found untracked top to bottom lines in the glades away from the main slope. A dramatic drop in temperature was felt by mid-afternoon, with a reading of minus 17 as we packed up at the trailhead. Mon Jan 28: “east” elk pass. 2-3 inches of fresh at pocaterra this morning. Same at blueberry junction. -18 to start at 930 from the elk pass lot. -6 on return at 330. Hwy 40 was a bit slick in the morning (snow tires) but better than the slush of the afternoon. Broke trail from the lot to the pass but good waxing in the cold temp and fresh snow that made travel efficient on the AT gear. Skins on shortly after leaving the grooming given the snow quality. Boot top to knee deep ski pen off trail. Probably get away with beefy light touring gear if not for all the little drainage ditches. Railway grade on average essentially. You’d want skins as a back up. Navigated through the “hallway” linking the meadows by following animal tracks and midday sunbeams. About 1.5 hrs of travel off trail to get to pass. Wonderful views south down the elk valley and of pocaterra to the east. Lots of great terrain to explore. Intended to go to the knoll to the SW, see if there was a view towards elk lakes, but couldn’t see a cut line for the boundary line that works its way over to the summit. Also very tempting to just keep following the massive long meadows down the west slopes. That would make for a long day trip breaking trail. An excellent day exploring new terrain in brilliant sun and light winds. The only down side to the day was forgetting the chocolate and the walkers in my separate track down the middle of elk pass trail on return that made for alot of back slipping and cursing the ensuing ankle pain. At least they didn’t walk in the groomed tracks eh. Arrrg! Taking advantage of the trail breaking I did partly up from Shadow Lake Lodge last weekend, before any new snow fall, I went back to finish the job and get all the way to Gibbon Pass. This time, my skins didn’t give up on me. No one else skied to the lodge yesterday, as I was skiing back down from it on my own mid-day arrival, over 2 cm of fresh snow. Skiing on Red Earth Creek is still quite good and fast. To put things in perspective, after getting to the lodge and 13 km of skiing, half the elevation 900 m elevation gain to the pass from the road is to be covered in the remaining 3 km. The first near 2 km up from the lodge was made much easier for me, as I did not have to break trail again. Picking up the last km of distance and 150+ m of elevation, I was quite happy to come out in the open meadows with a few larches spread apart. New trail breaking to the high point general area of the pass involved 20-25 cm of (light touring) ski penetration. The cliff faces of Storm Mountain and some unnamed connecting ridge, respectively NW and immediately east of the pass, are imposing when you stand there alone. No wind at all at the pass and about -4 C. Got some views of Mount Assiniboine, as I was breaking out of the thinly forested area. Unfortunately, by the time I reached the open meadows, clouds were hiding the Rockies Matterhorn. Either way, other views from the pass made the long climb worth the efforts, in such a very peaceful wilderness setting. Some interesting terrain toward Little Copper Peak, for turns in the alpine and subalpine (with wider skis of course). Another day maybe. Nice to be out there. It was a quiet day for skiers at Rummel Lake. We saw several groups of snowshoers and hikers, but no other skiers. Travel conditions were good on a well packed trail. Trail breaking beyond the well beaten trail was mostly supportive, with some unsupportive spots around shrubs and in thin areas. Nice November conditions… but this is already late January. It’s interesting to note that the phenomenon of golden needles lingering on larch trees seems to be very widespread this winter. Perhaps that early October snowfall and cold weather was a big shock for the larch trees and many of them just forgot to drop their needles? “Mechanical forest thinning”…outside of Banff Park, that is called logging. Good one, Alf! I would guess this is part of the FireSmart program. My drive by assessment this morning was definately logging. Looks like it has been clear cut quite a bit on that west shoulder. Protecting the interests of new summit infrastructure maybe. An unfortunate and conflicting decision. Yesterday, we decided to take advantage of Chuck’s trail breaking before the next big snowfall. A beautiful, cool day with little wind and spectacular hoar crystals everywhere. The broken trail made travel easy although Chuck must have had some pretty special wax to make it up some of the hills without side-stepping. Blue wax worked well while it was on the skis but we all found that it wore off pretty quickly in the very abrasive snow so we needed to rewax multiple times. There was evidence of a few other skiers had also skied there in the past week and some very old tracks. And Chuck’s tracks have made this valley much more accessible to wolves as we saw a lot of evidence of them most of the way to the meadows. Two skiers turned back early in the vicinity of the upper meadows and the other two skied on to the warden’s cabin. Parks needs to have a word with the moose who postholed the lower two kilometres of the trail some time during the day between our trips in and out. The last few kilometres of the groomed track was done in moonlight and it was magical – the moonlight would briefly reflect/refract off the hoar crystals making it appear like fireflies. Great report Rick,,, glad you enjoyed the trip. Thanks for keeping the trail open! An exploratory trip up Johnston Creek, on a beautiful blue sky day. Climbing skins and metal edges are beneficial on the heavily used snowshoe portion. CHICKADEE VALLEY – cold day today…..we used our BC skis and skins to ski up the Valley. The snow is hard and packed up the creek from the snowshoers. Nice trail to the end of the valley but lack of sun made for a cold ski. We skied down the steep parts with our skins on so that we wouldn’t land in any of the hiding water holes!! A beautiful valley, we will go back again when the sun is higher. Lots of animal tracks. Avalanche awareness day Jan 20 in k-country, burstall pass parking lot. This was my 3rd trip to at least Shadow Lake lodge in the last 6 weeks. Given the excellent conditions to get there as described in recent reports, it was time to go back and do some exploration in the terrain around. After a fairly smooth and easy ski in to the lodge (great trail conditions made a difference, along with a glider applied to my light touring skis for the 1st time in 5 years! ), I decided to ski up to Gibbon Pass, a trip I normally do later in the spring. I can guarantee you I was the very first one this winter to tackle the trail breaking up from the lodge. I enjoyed the suffering of the collapsing snow layer, sometimes to the ground while in the trees. I was able to follow the summer trail for most of the way, with rabbit tracks on it (they know where to go). Quite hard work over the steep switchback section, for the first 300+ meters elevation gain from the lodge. Far more time taken, as opposed to follow an already broken trail in the spring, by clients at the lodge doing day trips. Once I hit the opened gulley higher up (the skier-left one if you ski from Upper Twin Lake) toward the larch area, the snow support for travel got a bit better than in the treed area. Unfortunately, my skins keep getting unglued to my ice-up ski base. I turned around at my planned cut-off time of 2 pm. Given the conditions, I figured I was about 45 min from the large Gibbon Pass cairn and another 100 m elevation gain. Going back down to the lodge was not pretty (!! ), but I did not fall. Being alone, that’s all matter, right? Didn’t see anyone, until about 3:15 pm when a group of 3 was about 1 km from the lodge. In all, a 30-km day. Not my longest distance of the year (GC-Banff return, it was last weekend), but certainly the longest time on skis this winter for a day, with close to 800 m elevation gain on light ski touring gears. The ski cruise on the way out from the lodge was much was much welcome to end the day. Got a great shot of the moon over Pilot Mountain, looking straight up the lowermost avalanche runout area on the REC trail. A great day to be out there. Enjoy the scenic (or not-so) shots of the days. Pure Magic… our best day of the season so far. Cold powdery snow, and sheer beauty in the trees. Wonderful! More sunny than redearth. Followed Chuck’s tracks along the Upper Spray, although not all the way. Thanks Chuck. Some postholing by wolves on the lower portion of the track. Perhaps Bob could have a word with them. Another blue sky day on the Upper Spray. Saw 2 people at Mt. Shark, otherwise no one else all day. Toured up the Healy Pass trail from Sunshine Parking lot on Jan 10. The snow coverage was quite good… enough that you didn’t have to cross that stupid skinny bridge over Sunshine Creek. The trail has seen enough traffic to be well packed, with enough new snow for smooth skiing on the way down. At tree line elevation, there was a good deal of wind effect, with scouring and wind slabbing, but enough soft snow in sheltered areas for some turns. I headed up Chickadee Valley on Jan ll. There were no other skiers, just a large group of snowshoers. The creeks and marshy areas are well filled in, so the tour along the valley and back out was most enjoyable. The mountains along the south side of the valley have huge, vertical walls… which means that no sun reaches the valley bottom at this time of year. It’s spectacular, but don’t expect to find a sunny spot for lunch! Consider this as a continuation of my January 7 trip, described below in the Upper Spray. Traditionally, Burstall Pass may be an easier access to this destination, but with a trail already broken in the Upper Spray, and high avi risk via the pass, this was the chosen route. Did not have to use climbing skins today, as I had already broken trail up all the steep slopes, so this is now an easy day trip to an amazing area. Intrigued to meet John Blum again, this time coming out from Bryant Creek Shelter… the only other person I saw all day! Three great days of skiing the Rossland Range under generally cloudy but otherwise pleasant conditions. First day was spent going to Cutblock Peak near Mount Plewman, second day to the Summit Trail and today to Elgood trees. Lots of snow, generally stable and, until today, little wind effect. There has been about 15 cm fall in the last 48 hrs and that has meant some great skiing on windward slopes at treeline and below. Tomorrow will likely be an XC day at Champion Lake or Nelson Nordic. It’s great that there are so many choices in the area. With the recent track setting on the Red Earth Creek trail, I figured that some may have already ventured all the way to at least Shadow Lake lodge. However as of 11 am yesterday, the skier track had not gone past the lodge turnoff. Trail breaking to the lodge was relatively easy with about 10 cm of fresh snow on top of the previously broken trail. As soon as I would step asides the trail, skis would sink almost to the ground across about 30 cm of snow. Arriving at the lodge under sunny and windless conditions was much welcome. Broken trail to the Shadow Lake outlet bridge. Snow stability is pretty poor, as seen from propagating hairline cracks around my skis, when breaking trail (see photo). With my poles, the profile across the snow cover in the meadows to the lake was fairly simple: 5-10 cm of loose fresh flakes on top of 25 cm crust, itself on a depth hoar loose layer above the ground. Given this, lots of slabs are bound to slide in the alpine, once snow falls add weight on the pack. I figured the bridge at the lake was a good turn around place, given the trail breaking done. The views of Mount Ball were as always very scenic, with its snow flutes running down from its broad and imposing summit. When arriving back at the lodge, it was nice to meet David Mulligan, a fellow I climbed Mount Fairweather in 2006 (Rocky Mountain Ramblers expedition). He had skied with good old wooden skis! On the steep section before reaching the Red Earth Creek trail, I met James who was working hard on packing the snow on that difficult section. With all the traffic to the lodge yesterday, the trail is now well broken pending a snowmobile packs it down further. The fast ski out down to the highway is always a treat, after the slow trail breaking higher up. Enjoy the photos the captions. More snow is needed to exit via the lodge meadows area via the canyon, given also the poor slabby conditions to stabilize down to the ground. Choices for Light Touring, Alpine Touring, snowshoeing, walking, dogs or maybe even fat bikes! Mt Shark to Big Springs BR9 return, good cover and skier set track throughout, air temp was around -10, VR40 on light touring work well, even on the big hill back from Upper Spray River bridge. looked like good skiing to be had on the trails around Mt Shark. Black Prince Cone Dec. 23rd. Ray and I ventured back to the same area skied this past Tuesday. More storm snow had fallen and, with colder temperatures, the snowpack is not consolidating quickly. We skied to the cone-shaped slide area just west of the tarns. As we approached the run-out zone we crossed last Tuesday, it became apparent that a slide had come down, almost to “valley” floor. We couldn’t see a start zone, but even at our elevation of about 1750 m, the size was large enough (maybe size 1) to break trees 4-6 inches in diameter. There was also evidence of a slide of, perhaps size 1.5-2 that ran at least 200 m down from above the pinch-point of the cone and covered much of the low-angle slope that I’ve skied on several occasions. The start zone was under an east-facing ice feature at the base of a rather steep rock face. Couldn’t age this slide. Conservative skiing above this point on a SE 20 deg slope was not terribly supportive and we had remote whumpfing to remind us of the risk. We dug a pit at that elevation and slope, HS=70, CompTest failure at H23 down 47 cm. I ‘m sure that the verbiage has some errors, but you get the idea. Start temp was -14 C at 9:30. Ending temp was -6 at 1:30. Fortunately, no wind in the area and partial sunshine made the day worthwhile. Other parties skied the normal glades north of the tarns and said the snow was good, though inconsistent, with much the same profile as we had down below. Another Chester report! We lucked out on our afternoon ski tour up to the Elephant Rocks, as the intense blizzard that we drove though turned to brilliant sun at treeline. With about 10 cm of 24hr new, over a well traveled trail with a firm base- the skiing was easy and fun, both up and down. Breaking trail off the beaten track is best described as tedious through the 40 cm of storm snow which lies atop above a weak, not always supportive mid-pack crust. One highlight of the afternoon was being able to enjoy a smooth skier set track that was completely untrampled- a rarity these days it seems. That is- until we encountered a doofus on our way out, who was walking up the final km of trail, all the while inexplicably carrying his skis (complete with skins) on his pack. Go figure! We didn’t run into Steve and Jo, although we were also in the Chester Lake area today… but we did see the guy and his two dogs, walking towards Chester Lake carrying his skins on his pack. I’m still shaking my head. One thing that Steve didn’t mention is that there were still golden needles on a number of the larch trees. Those needles have managed to hang on from the autumn equinox to the winter solstice, through snowfalls and wind storms. Remarkable! Larches are still golden up in Healy Pass as well ! The south end of Smith-Dorrien road is recently plowed and in very good shape. The Chester Lake parking lot was full of snow today, and a lot of cars! Quite a few got stuck in the deep snow and needed help getting out. A few skiers ahead of us also, on the ski trail, which was fabulous with tons of fresh snow and really ideal conditions for that trail. I second Diana’s report! I skied to Chester Lake & the Elephants on Wednesday too, and the brand new 30 cm of snow made for very good skiing conditions. After a final field day of the AST2 course, a few “graduates” headed out to Black Prince for some practice and, we hoped, a few turns. We arrrived at 11 a.m. to the resident moose cow and calf, waiting to lick the salt from our car. The predicted winds were not to be, with barely a breeze to be felt. There was heavy snow falling, the mercury read -2 and it was clear that there had been substantial accumulation recently. We dug a pit at about 1800 m, near the tarns. The snow depth was approximately 80 cm, with 25 cm of fresh on top of another 25 cm of faceted snow before hitting the Oct. 26th crust. Continued on in a westward direction, as if going to the Warspite Cascade. Several avalanches, one at least 2.5 were seen/heard. Dug another pit at 1850 m on a 20 deg, east aspect, below the fan. Comp Test failure E4, EPT M11. We turned back and had a wonderful run down to the car, and the moose licking on the only other vehicle in the parking lot. Things need to settle down quite a bit before it’s safe travelling in avi terrain, I think. We did a recon of the Robertson Glacier route: Plenty of snow along the road in to Burstall/Robertson – just a few roots exposed on the singletrack section. We followed ski tracks for a short while once on the outwash plain, but cut our own along the proper route. Several size 1 recent avalanches skiers right as you head towards the narrowing of the valley down the gullies reaching the valley bottom. Winds calm, but wind effect on snow evident. We stopped in the narrow area in a safe place to de-skin, as the snow pack is not sufficient for those caring about life and limb to go any further. Abundant evidence of wind scouring on the glacier and outcrops. Wait a while. Headed up to Boom Lake on Sunday. Lots of snow made for generally excellent coverage. A couple of small ice flows have been almost entirely covered up and the occasional creek bed crossings have been largely filled (small depressions only). If you are comfortable with the usual mix of snowshoe and occasional hiker traffic, not a bad option for the chronically snow deprived! Went to Chester Lake today. Late start and arrived at 2pm. Minus three. Skinned up to lake. Their was about 5cm of fresh snow. No wind. Trail was in good shape and most of the hazards were covered. It would be nice if the snowshoers and walkers could stick to their trail. Back at the vehicle by 3:40. Nice to out in the mountains. Another day in the sunshine meadows, wandering about in the sunshine getting a good winter tan base. Went up the ridge at the north end of Quartz hill and trundled along over the pine and larch covered hills to rockbound lake. Lots of trails in the area offering lots of opportunities to expplore, some more efficient than others and with various destinations. Surface hoar is present right up to ridge top (10 mm). Like skiing through chandelier carpet. Snow depths vary a bit more along the ridge, from 1 to 3 ft. A bit deeper trail breaking along the ridge (10″) compared to the meadows. Only the odd punchy spot near trees and rocks but otherwise excellent travel. The second day out is always so much better than the first time using those dormant ski muscles. 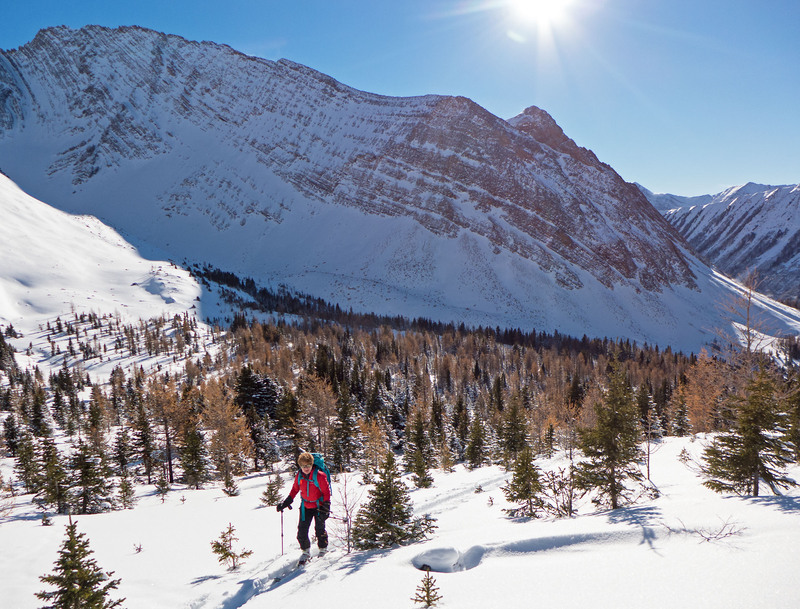 While Steve was skiing Arethusa cirque, we went west, battling a pretty marginal and at times icy trail through the trees until things opened up underneath Mount Tyrwhitt. While some young bucks set an up-track on steeper, east-facing slopes, we continued to easier terrain on the south end of Pocaterra Ridge. We didn’t have as much sun as on the east side of the highway, but the views were amazing. We need more snow! Not much of a snowpack yet on the sunny side of the Highwood. Fifteen cm of sparkling new under bluebird skies had our hopes up. In treeline glades there was a bit less than 40 cm at most, consisting of a thin icy layer at ground, then a variable midpack with an inconsistent crust or two. Travel was easy, but the often grabby crust and variable snowpack made for poor-fair ski quality overall, although a few short pockets of decent turns were had. Nonetheless- it was an absolutely glorious day to be out in the backcountry, and we lingered to savour the warm sun under glowing larches, many of which still had some color to them. The narrow trail out was very thinly covered in many spots (don’t bring your good skis!) but easy enough to carefully negotiate on skis. Skoki Trail – Halfway Hut. Toured along the Skoki trail today, but just to the Halfway hut and back. Good supportive snowpack the entire tour even though there is plenty of low brush poking through here and there. We had planned to head up toward Hidden Lake and Richardson Ridge but got a bit of a late start and found the trail past the halfway hut unbroken so we bailed. 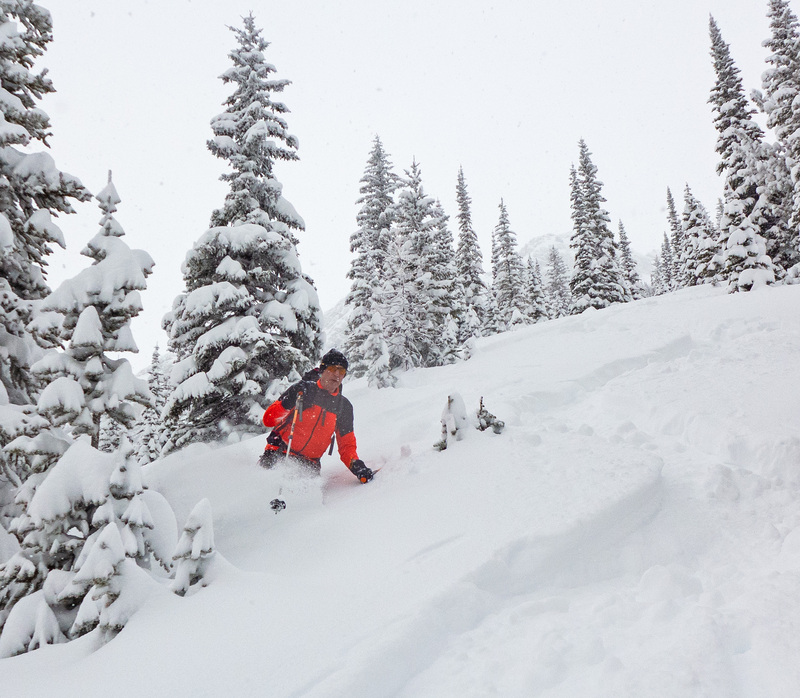 We did manage some powder turns on some of the lower Lake Louise ski runs on the way out. Spent the day (Nov 7) looking at conditions in the Smith Dorrien Valley. Snow is thinner in the south around Black Prince and a bit better at Chester Lake and Burstall area. We attempted to climb in to Mt Murray Glades but turned back due to thin snow, weak base and open water. We climbed up to Chester Lake and to the slopes above the Elephant Rocks. Snow depth is around 20-25cm with intermittent base. If you want to get some turns, don’t bother, however the views are magnificent. The trail up to Chester is quite good. We skied from the parking lot and the descent was fast. While I have been into Murray north in november before, it’s only ever been after a week or so of solid cold temps to freeze up the second creek crossing. No risk of avalanche yet, but bring bear spray!